As I've mentioned on the shorter FB version of this here.... I've been lucky enough to have a jaunt around the home country these last few weeks, ostensibly to fulfil the role of 'best-man' at a dear friend's wedding, but you (and he...) know I wouldn't miss the opportunity to turn the trip into a book-shopping-fest!! So first, the raw data... the numbers.... 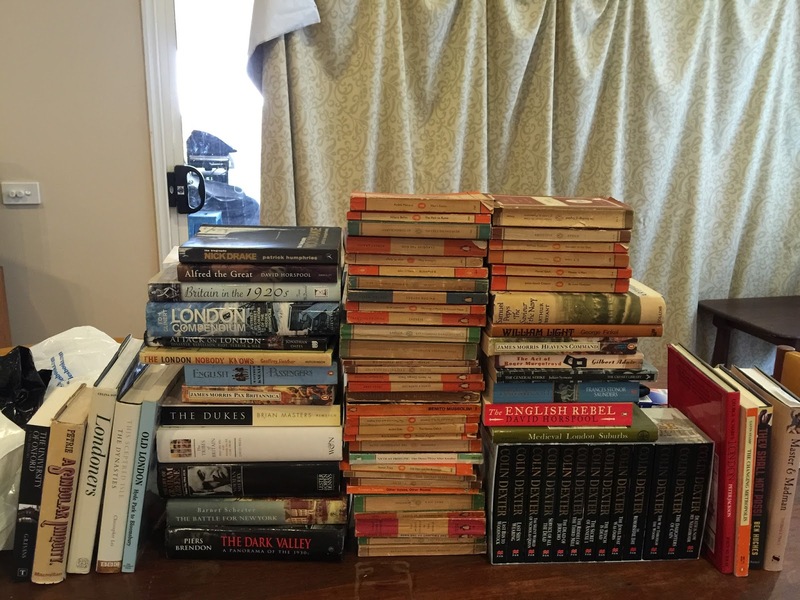 I managed to buy 82 books for the BLM private collection, bought from a total of around 15 book shops and stalls, spread across 7 towns and cities across the south and middle of England, and even just over the border into Wales! I only ever buy books I fully intend reading! Sounds obvious right? But for a book collector, as well as an avid reader, a very important distinction. My personal library currently sits at around 2100 books, give or take. I'm a keen reader, but, real life gets in the way to some degree, and I'm not blessed with the skill and focus of my co-BLM writer, Baju, who can seemingly just pick up a book and absorb the contents via high-speed osmosis! So I only buy books I fully intend reading, whilst fully aware I might not get around to all of them in this life time. (As an atheist I assume this is the only lifetime I get but I'm prepared to consider religions that offer extensions to finish reading one's own book collection...). So, the number of purchases is not excessive, because I want, and intent, to read them all! 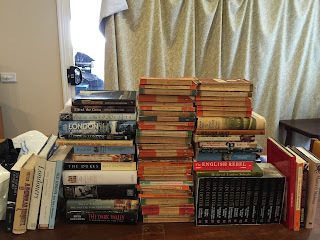 1: eBay is a good source for book collecting, I know it's not exactly supporting local bookstores, but book loving and collecting is not always about that. 2: if you do buy books online, from eBay or other sources, think outside the box in terms of how you get them all the way back here!! "So, where did you find these books?" I hear you whisper at a level appropriate to a library.... Well, I shopped in London, Oxford and Cheltenham, Winchester, Farnham and Ross on Wye, and, of course, Britain's very own Booktown... Hay on Wye! Some of Britain's greatest historical towns and cities, some beautiful little places unknown much beyond the locals. That's one of the things I'm proudest of when it comes to my British heritage, the depth of history, the stories that are there, have been there for hundreds, sometimes thousands, of years in British towns, cities and villages. One of my major fields of literary interest has always been British history, as many of you will already know from previous posts, and if you ever have the opportunity to visit Britain, make sure you take the time to visit the small villages and the market towns, as well as the big cities. Their history is fascinating, not because it's British, but because in Britain we have been lucky enough to have much of the historical record protected and preserved. It's an area of history that has a strong relevance to the history of Australia, and I believe we are who we are, in part, because of where we came from. So, lecture on why you should read history over... Where, then, did I go? Well, purely based on the location I was staying in at the time, my first port of call was the town of Farnham. Now, Farnham has been a settlement for literally thousands of years... the name comes from the Anglo-Saxon Fearnhamme, look it up here to find out why... but what interested me was its OXFAM shop. For those of you unaware what OXFAM is... look here... one of the best things about them are their book sections, or, occasionally, their dedicated book shops. I've always been a big fan of the Inspector Morse TV show, so when I found the full boxed set of paperbacks, written by Colin Dexter and published by Pan, I had to buy them, especially as the cost me only nine quid! That's $18!! Bargain!! Right?!! My next book-shopping opportunity was on London's Southbank, a few hundred metres along from the Millennium Eye, (that's the great big ferris-wheel thing on the southern bank of the Thames...) Those in the know will tell you about the great book-fair that takes place there every-frickin-day!! 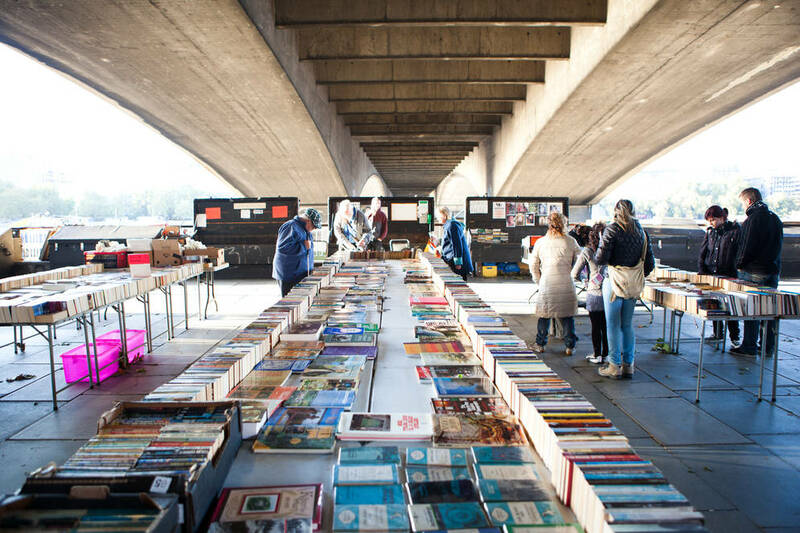 Nestled right underneath Waterloo Bridge...(the one mentioned by the Kinks in Waterloo Sunset...) This really is one of London's best kept secrets, loads and loads of reasonably priced second-hand books. 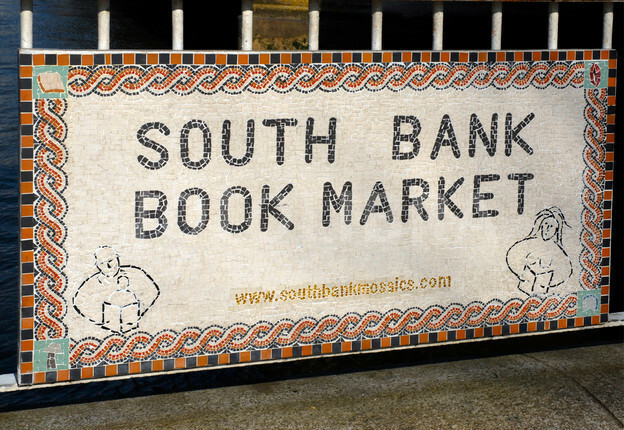 If you go to London and you're a booklover, you HAVE to go there! But never fear, of course I managed to squeeze in a bit of book stuff.. notably a bit of time hanging around in Charing Cross Road, THE place to go in London for secondhand books. Make sure, when you visit not to miss out on Cecil Court, off Charing Cross Road, which houses 20, yes, 20.. book stores!!! A quick sortie into Winchester to visit the Science Centre with some very dear friends and their kids, gave me an opportunity to stop in at The Winchester Bookshop where I picked up a couple of great little bargains!! A few days later, my own personal book tour really began, when, given a couple of days book-buying freedom by my long suffering wife... I went on a fast-short-awesome book buying spree...! Well, actually not so much alas, because just a short while later found me in Cheltenham in The Cotswolds, where I paid a visit to Attic Books a tiny but jam-packed bookstore run by proprietor Roger, who was a charming chap, very keen to promote the many book buying opportunities in the Cotswolds, (make his store the first stop of your trip and he'll give you a leaflet detailing twenty other great places to feed your book-buying habit!). 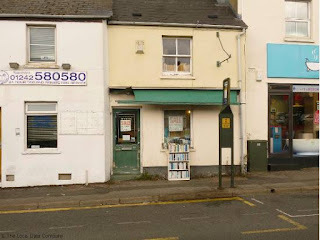 From Cheltenham, half an hour or so driving later found me in Ross on Wye, a gorgeous little town in Herefordshire and the home to Ross Old Books another wonderful repository of second-hand -biblio-heaven! Local hint, park in the car park behind the shops opposite, you'll find it if you drive around the block, and there are a couple of great little pubs nearby! An hour of winding beautiful country roads later and I made it to my final destination on my trip Hay On Wye! Now, this little town sitting right on the Wales-England border is a stunner for character, countryside, antiquing and tourism, but what really makes it for me is the concentration of great book shops in such a tiny space! Click on the link a line or two back for a full rundown, there are many! 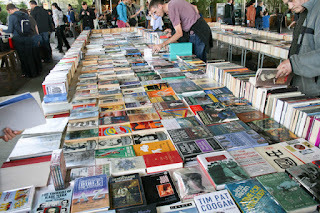 Hay is the original Booktown, a phenomenon that now has a global presence, started here, with The Hay Festival in 1988. From the moment you see it, with it's metal book containers outside, that lend it an air of London's Southbank, mixed with the stalls of the Rive Gauche in Paris, you are drawn in, to what is, quite frankly, a less than attractive building.... Until you step inside. The scale is suitably magnificent, the seemingly endless shelves, the creaking floorboards, the incongruously decorated ceiling that reminds you, you are actually inside a converted picture house.... I loved every moment I was there. I dare any bibliophile to feel otherwise! That was it. The final place in my wonderful, short, awesome, book tour of a small part of Britain. 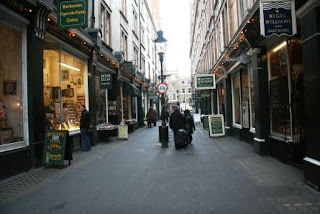 I'd urge any of you that get a chance to visit the UK, to try and drop in to some of the wonderful book stores there. Not just the ones I've mentioned, excellent as they are, but all around the country. There is so much to see for bibliophiles, hidden away in little towns and villages, as well as in great, big cities. It made my trip back to the my home the best visit so far, the chance to wander around such great places of learning and education, places of pleasure and indulgence. Without wishing to sound too self-indulgent and, frankly, elitist, visiting bookshops in the UK is a deep cultural experience that served, for me, to strengthen my belief that being a book lover is not only a wonderful hobby, it is one of the most satisfying ways to experience life. They say travel broadens the mind. If you combine it with book hunting, you have the opportunity to see into the minds of others too.